The content itself wasn’t bad; it was full of valuable information, and you even drove a sale or two afterward. But once the event concluded, you were left with a sense that the presentation wasn’t as good as it could have been. Perhaps your presentation suffered, for instance, from poor video quality, but you lacked the ability to change your camera’s settings in the middle of the live feed. Or perhaps your audio cut out at one point and left your attendees with several seconds of dead air time. These little inconveniences may not be enough to ruin a presentation altogether, but they could be enough to diminish the overall quality and leave your customers feeling less than inspired about your brand. The truth is that your business’s webinars could be so much more powerful with access to the right webinar services. Using a product like Onstream Webinars, your company will gain access to a premium conferencing suite that will make it easy to host first-class webinars. With a full multimedia library to access, the ability to adjust your settings at any time, and over 100 features, moderators will have an easy time conducting flawless presentations and interacting with attendees. Further, you will gain access to specific tools for walking attendees through the registration process and following up with them after the event. 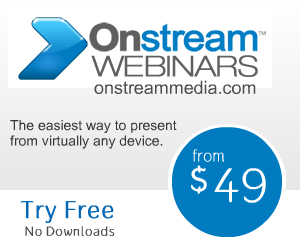 Are you ready to experience the power of Onstream Webinars? Click here for more information about how this advanced webinar platform can maximize your chances to impress your customer base.